Tucked around corners and outside buildings, the works create moments for conversation and reflection. 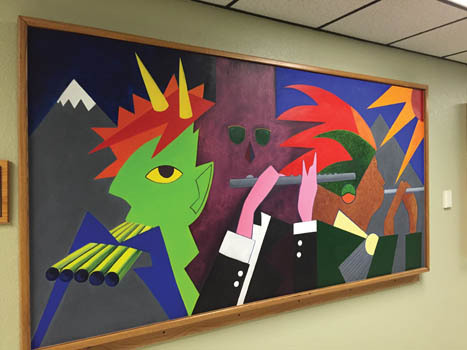 Pipe Dudes, a mural by Leo Soisson, a retired lecturer in philosophy and liberal arts at Missouri S&T, hangs in Castleman Hall. 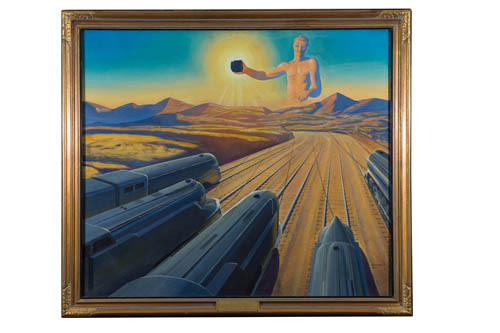 Might … To Move Mountains, an original work by Rockwell Kent, illustrates the power of coal and recalls S&T’s mining roots. Housed in the library, the piece was one of 10 commissioned by the Bituminous Coal Institute. 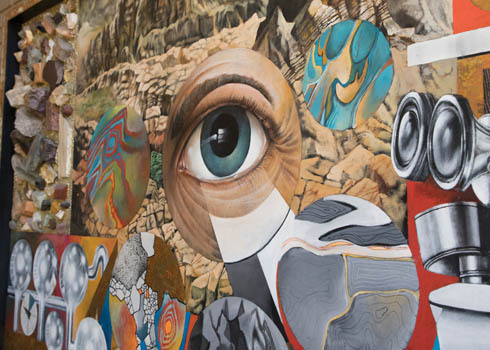 The Eye, painted by the late Siegfried Reinhardt, hangs in Centennial Hall. The German-born artist spent most of his life in St. Louis and has work in the Vatican Museum’s permanent collection. 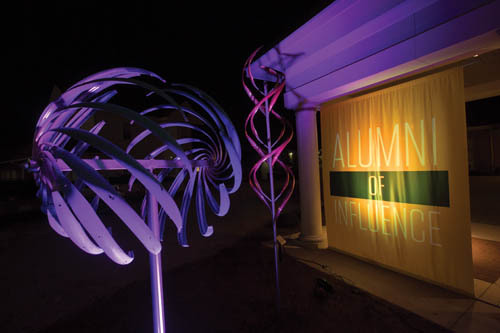 The Infinity of Influence, a kinetic sculpture located in the Vaninger Family Plaza outside Hasselmann Alumni House, was crafted by Mark White in honor of the university’s Alumni of Influence. The piece, dedicated in 2016, is designed to respond to wind velocity ranging from the slightest breeze to a 100-mph gale. 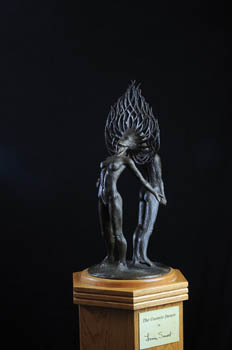 The Cosmic Dance, a bronze sculpture of a graceful couple by Louis Smart, is located in the foyer of Castleman Hall’s Leach Theatre. In the lounge area of McNutt Hall stands Today’s Miner by Gary Prazen. 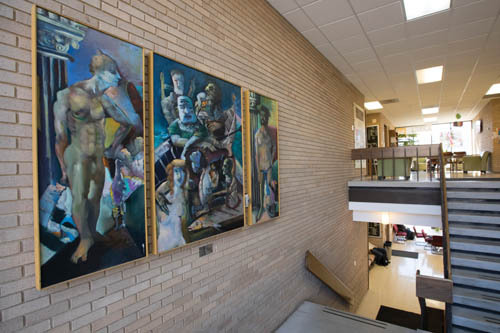 On the landing between the first and second floors of the Humanities-Social Sciences Building sits The Sacrosanct, a triptych by Edward Boccia, an American poet and painter known for his large-scale paintings in Neo-Expressionist style. It was donated by Morton D. May. 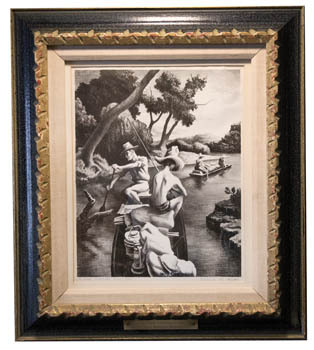 Down the River (The Young Fisherman) is one of two lithographs by Thomas Hart Benton that hang in the Havener Center. The pieces, signed in pencil, were donated by the Karl Moulder Memorial Fund. 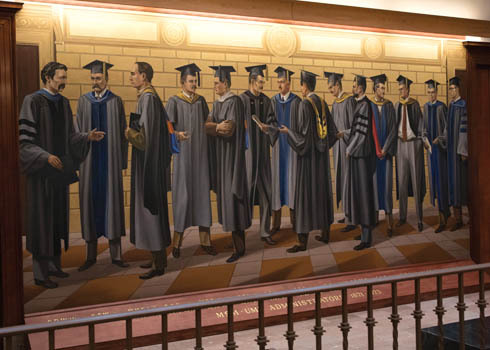 The Parker Hall Mural, which depicts past S&T directors, deans and chancellors, was painted by John Koenig. It hangs upstairs in Parker Hall. Note: one of the figures in the painting has a missing foot. 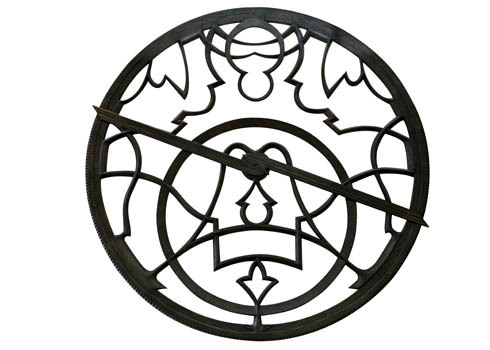 Astrolabe , which hangs in the Curtis Laws Wilson Library, was commissioned by the library from Jefferson City-based artist Thomas Schulte. It celebrates the interrelationship between the artistic and the technical, as well as the history and future of science and technology. Located on the second floor of the Havener Center, MSM/UMR 20th Century, painted by the late Jack Guth, CE’50, depicts scenes from campus history. 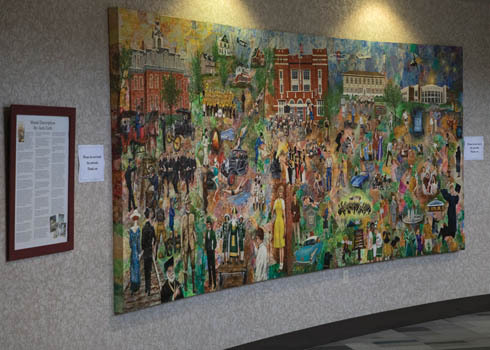 Unveiled during Homecoming 2005, the 15-foot-long acrylic on canvas mural consists of five panels, each 6 feet high by 3 feet wide, that depict campus life from the end of the 19th century to the beginning of the 21st. Each panel represents approximately two decades in time with activities and events overlapping. 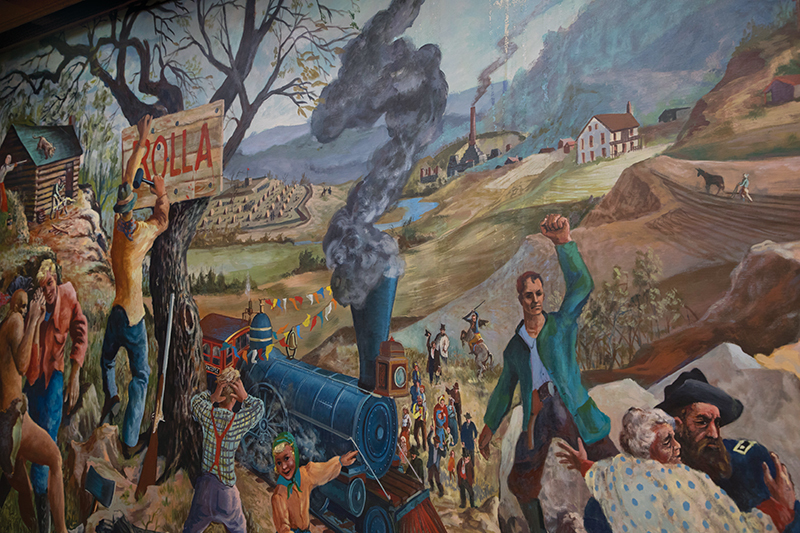 The Rolla Mural, a 5-by-22-foot painting by Sidney Larson, now hangs on the second floor of the Curtis Laws Wilson Library. The mural depicts the history of Rolla from 1844 to the 1950s and features historical figures and buildings. Painted on canvas, it was created using casein and egg-tempera as well as traditional egg varnish and affixed to wooden panels with a white lead siccative. Commissioned by the late local newspaper publishers Edward and Alma Sowers, the piece was unveiled in 1953. It hung in the Sowers Building, home to The Rolla Daily News, until it was donated to the university in 2016. In January 2018, the piece was moved into its current location, where local artist and Rolla native Dan Woodward completed the much-needed restoration work. For 37 years, the St. Pat’s Statue resided in the library under the false pretense that it was bronzed. (The statue, created by St. Louis sculptor Rudy Torrini, was actually made of plaster.) 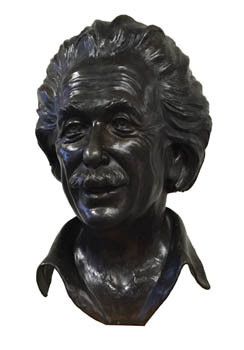 In August 2008, the statue was shipped to Astoria, New York, where the Modern Art Foundry used it as a mold to cast it in bronze using the lost wax process. 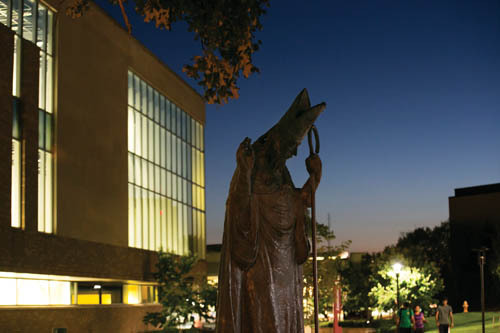 The bronze statue now resides at the corner of Toomey Hall overlooking the library, where it was placed during the 100th anniversary of the St. Pat’s celebration in 2008 and dedicated in March 2018.